This is a beautiful Antique/Vintage bracelet & pendant set with the bracelet known as a “Carmen” adjustable or expansion bracelet. The Carmen bracelet was first patented on May 20, 1890 and then again on February 5, 1901 and is amongst the most sought after by collectors. The magnificent centrepiece is studded with a large sparkling FAUX CITRINE yellow paste or crystal stone within a silver tone setting encrusted with a border of clear and sparkling brilliants.The S shaped links alternate between plain and richly embossed. They are tight, attached and secure. 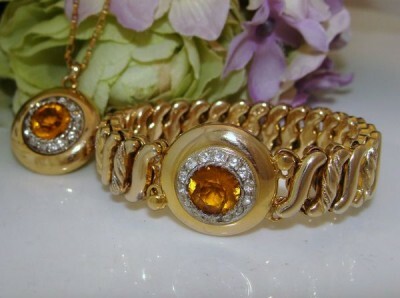 The pendant is identical to the bracelet's centrepiece and is complete with the original elongated box chain necklace. Better-than-Excellent Antique condition. There is no visible wear to the finish and no dents, damage or repairs – it is an all-original set. It looks gorgeous on and you will be very pleased with this Beautiful set!